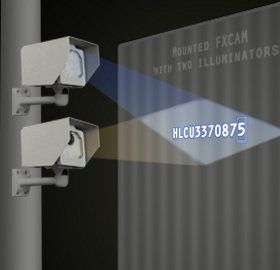 ﻿ Automatic Container Code Recognition | ACCR technology: software and hardware from ARH Inc.
We design, manufacture and market OCR software for Automatic Container Code Recognition (ACCR): processing container codes automatically by computer systems. We are on the market since 1991, committed to innovation, quality and reliability. As proof of our success, to date, approximately 1700 satisfied partners in more than 120 countries worldwide are using the image processing know-how of ARH Inc.
Our recognition technologies can be found in every continent, and in countries ranging from Australia to Brazil, and Saudi Arabia to Korea. The Carmen ACCR is developed to read ISO 6346 codes. ISO 6346 is an international standard for assigning unique codes to freight containers, commonly known as BIC codes. To get more information on Container Code Recognition products, visit the ACCR Introduction page.